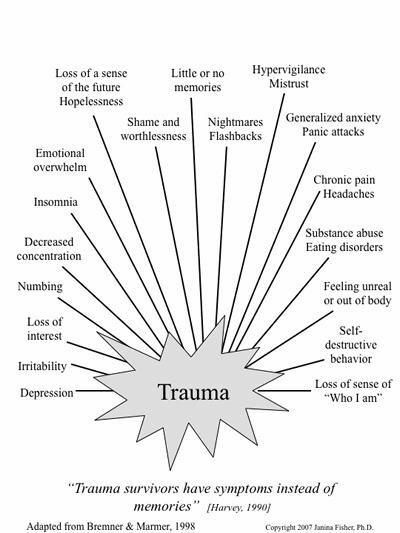 Trauma impacts the mind and body in numerous ways. I have worked with many children and adolescents that have presented the following symptoms. One client in particular exhibited each of the following trauma symptoms: Substance Abuse, chronic headaches, hyper-vigilance, mistrust, nightmares/flashbacks, little or no memories, shame, hopefulness, emotional overwhelm, insomnia, decreased concentration, irritability, self destructive behavior and depression. The client I speak of was 15 years old when I met him one hot summer day. I was surprised to get him into a counseling room after he refused to come to the correctional facility by physically refusing and fighting off guards. He was diagnosed with numerous disorders including depression, bipolar II, insomnia, substance abuse, PTSD and mood disorder NOS. Trauma definitely existed as a major precursor to such symptoms. It took him months to begin disclosing the trauma he had experienced which included domestic and gang violence.